Amazon Price: $203.99 $128.99 You save: $75.00 (37%). (as of October 17, 2017 12:21 am - Details). Product prices and availability are accurate as of the date/time indicated and are subject to change. Any price and availability information displayed on the Amazon site at the time of purchase will apply to the purchase of this product. Manufactured exclusively for JewelsObsession. 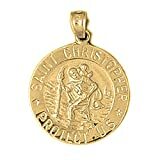 This is an elegant yellow gold-plated 925 silver st. christopher necklace. This yellow gold-plated 925 silver necklace measures 27 mm in length by 20 mm in width (pendant only, measurement includes bale). Includes 1.5mm cable chain in 16 inch or 18 inch lengths. JewelsObsession creates all gold jewelry in our state of the art manufacturing facility. Please allow 5-10 business days for items to be created and prepared for shipping.